A Pronoun is a word that takes the place of a noun. A pronoun (I, me, he, she, herself, you, it, that, they, each, few, many, who, whoever, whose, someone, everybody, etc.) is a word that takes the place of a noun. 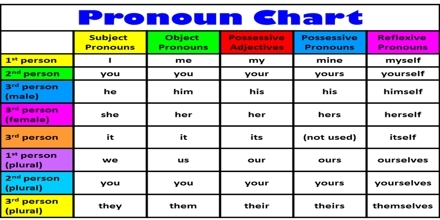 This lecture briefly focus on types of Pronoun; Personal pronouns (the subject of a verb and the object of a verb); Possessive pronouns; Reflexive pronoun; Demonstrative; Indefinite; Reciprocal; Interrogative (or) Relative pronouns and Other pronouns.